Drinks, food, floats, beads and music! New food, beads, and fun. Universal Orlando's annual Mardi Gras celebration is coming back this weekend. Only on 5, I got an exclusive preview at what's new this year. "What they can expect is a party," says Blake Braswell, Show Director for Mardi Gras at Universal Orlando Resort. Of course, there will be parties in the streets with tons of beads, "People go bananas for those beads," says Blake. But you may be wondering, what's new at this year's colorful Mardi Gras celebration at Universal Orlando Resort. In the French Quarter, you'll be able to have gator bites, jambalaya, shrimp gumbo, pó boys, and more. 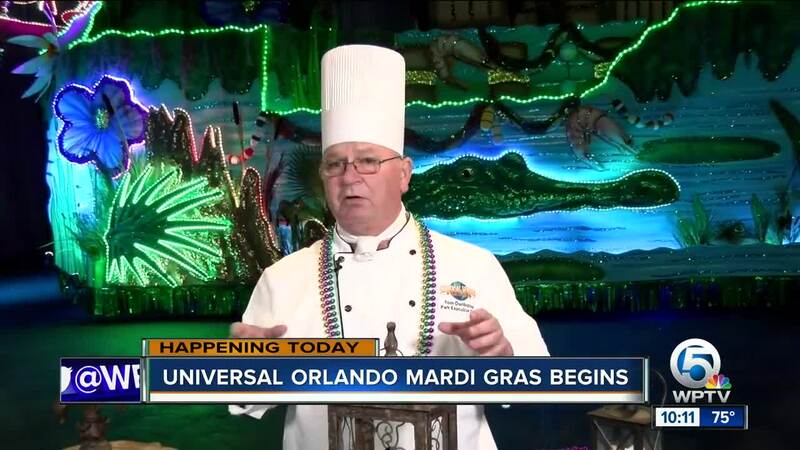 "The flavors we have here are right out of New Orleans," says the parks Executive Chef Tom Danboise. New this year is all the food is served in tasting-size portions. "One thing we learned from last year was our guest wanted to sample some of the different items versus buying an entire platter of food. So now they can have two, three, four, maybe even five flavors as they walk around the park," says Chef Tom. There are three specialty drinks that light up, like the Vicious Voodoo. Two flavors kept separated from each other until they mix in your mouth through two straws. Electrifying new floats featuring buzzing bees and flowers, a giant frog and lobster, and a sparkly turtle. On select nights there are concerts featuring acts like Dan + Shay, Macklemore, Pitbull, and The Steve Miller Band. Mardi Gras runs this Saturday through April 4. Right now, Florida residents can experience Mardi Gras with a 2-Park, 3-Day base ticket offer for $159.99. This offer is valid for admission to one park per day and is available for purchase through April 4 with a valid promo code from Coca-Cola® or Coke® Zero Sugar.